The Caribbean’s St Kitts and Nevis remain a relatively unknown superyacht charter destination, but with the opening of a new luxury marina, it’s the perfect time to discover their attractions, reports Cecile Gauert. The Christmas winds have started to blow as luxury yacht Capricorn leaves Antigua for St Kitts and Nevis. The weather forecast is pretty grim, forcing many skippers to revise their itineraries or even cancel plans. But none of the guests on board this superyacht seem concerned. The 42.7 metre, fresh out of a 10-week refit, is fitted with new zero-speed stabilisers, and anyway they are only going about 40 nautical miles west to Nevis. St Barths and St Martin, our final destinations, are well-known among the Caribbean superyacht charter set, although some feel they have become overexposed, even ruined by mass tourism. Chef and author Anthony Bourdain dubbed St Barths “the epicentre of evil” in his book Medium Raw, reserving particular vitriol for an overpriced plate of plain lentils. No such problem at St Kitts and Nevis, particularly the latter. They are Eden-like yacht charter destinations in which to reboot and recharge. The small two-island federation has little crime, a highly educated population, a stable government and a fascinating history. They also have abundant natural beauty. Alongside neighbouring Montserrat, Saba, Sint Eustatius and Redonda, the country is one of the “islands that brush the clouds”, the evocative title used in regional charter literature. All have volcanic terrain and deep water which offers few protected anchorages or marinas – perhaps the reason why few superyacht charters visit. They don’t have the British Virgins’ crystal shallows and sugar-white beaches, or the clubs of St Barths and St Martin. Yet there has been a steady rise in the number of yacht charters passing through St Kitts and Nevis. Between 350 and 450 now visit each year, according to official figures. The islands’ government is keen to attract more, and a couple of marinas are in build, including the ambitious Christophe Harbour on the south east coast of St Kitts – the most important luxury yacht development in the region. Capricorn rides through high winds that night at a steady 12 knots. In the calm of the next morning, I step from my upper-deck cabin as a single beam of sunlight touches Nevis Peak, a perfectly conical volcano. Spanish sailors thought its white crown of clouds looked like snow, so they called the island Nuestra Señora de las Nieves (“our lady of the snows”). Over time, it became Nevis. Our captain has chosen a spot off Pinney’s Beach, location of a Four Seasons hotel, one of two luxury beach resorts on the 36 square mile island. Apart from a few local fishing boats, not a single yacht is in sight and the small beach at Gallows Bay is deserted. Nearby Charlestown has been the island’s main city since an earthquake buried the former capital of Jamestown in 1690. No traces of it have ever been found, but divers still plunge off Nevis’s shores in search of this Caribbean Atlantis. There have been earthquakes since, but the volcano has not erupted in known history. The island’s volcanic origin also means dark sand beaches and 42-degree hot-water springs. It’s easy to forget the outside world exists on this island. The views, lush gardens and boutique resorts, several with ultra-luxurious suites and pretty gardens, invite introspection. 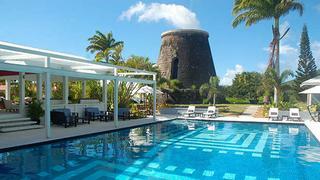 Montpelier Plantation & Beach is an exquisite Relais & Châteaux property converted from a sugar mill. The remnants of another mill lie in the gardens of Golden Rock Inn, an outpost of bohemian chic owned by American artists Brice and Helen Marden that’s on the edge of tropical forest in Gingerland. From its hilltop, you can see Guadeloupe, Montserrat and Antigua; above it all is Nevis Peak itself. 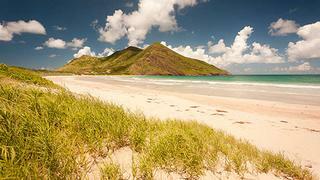 The cruise to St Kitts’ barely developed south east coast is quick but spectacular. Wind whips whitecaps across the Narrows between the islands, then St Kitts appears: wild, pristine and also empty of boats except for a sailing yacht heeled in the wind._ Capricorn_ anchors a few yards from the cliffs at White House Bay, near the entrance to Christophe Harbour. St Kitts (short for St Christopher) is also volcanic, but feels very different to its little sister. Mount Liamuiga towers 1,100 metres above sugar cane fields. Elsewhere, lava mounds and volcanic deposits have been buffed by the wind into hills rather than sharp peaks. The island’s development reflects a turbulent history of nations vying for control and a long association with the sugar trade. That past has left distinct architecture and interesting archaeological sites, such as the 17th century Brimstone Hill Fortress in a UNESCO-listed national park. Once used to move sugar cane, St Kitts’s scenic railway now offers views and a bit of history with your rum punch. Basseterre (literally “lowland”), is a stopover on many cruise ships’ itineraries, but St Kitts seeks higher-yield tourism, which explains projects like the high-end Christophe Harbour. Developer Charles Pinckney “Buddy” Darby III, who owns the Perini Navi Andromeda la Dea, has had plans for yachting here ever since he set eyes on 600 hectares of undeveloped land in 2007. Carved from an ancient crater and salt pond, sheltered from the wind, Christophe Harbour rivals European developments such as Porto Montenegro in its ambition and size, and not just because of a planned 300-slip marina. “The marina will be just as large [as Porto Montenegro] and the entire development nearly 10 times as large,” says Aeneas Hollins, former captain of Andromeda la Dea who now works with the harbour development team. Christophe Harbour will also have 1,000 hectares of low-density, luxury residences on landscaped slopes and a Tom Fazio-designed par-72 golf course. 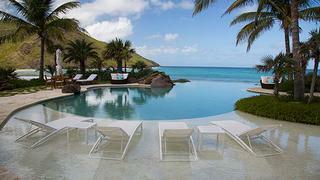 Completing the vision is the first Park Hyatt five-star resort in the Caribbean and an exclusive Pavilion Beach Club. The latter’s 900 square metre open-air pavilion at Sandy Bank Bay exemplifies the style of the project. Blending into the surroundings, it is a tasteful mix of modern architecture and colonial design: large slabs of sandstone, high ceilings with polished beams, ceiling fans, large white beach-umbrellas and an infinity pool that seems to merge into the Caribbean Sea. The drive to the bay, and several lookouts, reveal just how pristine this region is. From one lookout Capricorn appears like a toy yacht and is the lone vessel at anchor. To reach the highest vantage point on the island requires a challenging trek up to St Kitts’ Mount Liamuiga, however. The strenuous two-and-a-half-hour ascent up the dormant volcano takes hikers through beautiful American oceanic rainforest before they arrive at a crater half a mile in diameter. The view is well worth the effort. The British named the volcano Mount Misery but the native Kalinago name, Mount Liamuiga (“fertile land”), is more appropriate. Lush rainforest stretches out far below, trimmed by blue sea. On a clear day you can see to St Martin. The island’s other highlights are below the water’s surface, at one of the myriad dive sites; a popular activity on many luxury yacht charters. Friars Bay Reef only a mile from shore is ideal for beginners and Black Coral Reef is a fertile spot known for dark corals and big fish. There are also many wrecks, such as the River Taw, a 44 metre tanker that broke in two and now allows for excellent exploration. Capricorn finally arrives into a full harbour at St Barths. The red-roof buildings, palm-lined streets and white beaches give the place plenty of charm, yet the contrast to St Kitts and Nevis is striking. Those islands still feel like a secret; Christophe Harbour could well be the development that finally reveals it to the world. The 42.67m Proteksan Turquoise Capricorn was built in 2002, refitted in 2013 and sleeps 13. She costs from $135,000 per week to charter through Churchill Yacht Partners and cruises the Caribbean in winter and New England in the summer.